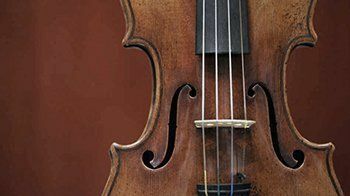 The Stradivarius violin built by Antonio Stradivari, during the 17th and 18th centuries, has defied attempts to explain, replicate or equal the quality of the sound and tone it produces. And yet, without the four strings, the Stradivarius is but a wooden box. I’m challenged by the command of Jesus in Matthew 10. It provokes me. A four-fold, magnificent, exciting and world-changing set of tasks were given to the apostles not as a challenge, but as their remit. Authority to heal the sick and cast out demons had been given to them. The issue set before them was not a challenge to them because it was something they could clearly do – and did. It was a staggering missions focus for them because in the natural, every single endeavour was impossible. What changed things was the reality and the conviction that with God, all things really are possible – and so, given the remit the outcome was inevitable. The apostles took the command seriously. Where do you even begin with this text that is a challenge to us, not an affirmation? The Church has moved out into the vast, deep and stormy ocean of history and left essential equipment ashore. I have an answer, but let me explain a little more of our dilemma. Hidden at the end of the charge from Jesus is an interesting and challenging statement, “You received without paying; give without pay.” Could it be that God is withholding His presence and power because we use it for our own ends rather than God’s glory? I have witnessed some ministries in the ‘prophetic movement’ selling their prophecies, dream interpretations and even ‘tattoo-interpretations” for a minimum price ‘love gift’. God has given them something freely, but they want something in return for sharing it. It’s shameful – but it is justified in their eyes because the suggestion is that everyone needs to make a living to be able to do what they feel called to. And reformed preachers and teachers are also not exempt from this. Where there is a will there is a way of justifying our actions, but Jesus clearly asserts himself here; don’t do it! I’m not saying this is the reason why we are not seeing people being totally healed (significant healings), the dead being raised, the incurable being totally cured or demons being evicted. It may be one of the reasons. Sometimes the only way that you can see a real Stradivarius is by putting the genuine article next to it. And that is what I think God is doing. He’s at work! Raising a taboo subject here can be a bit contentious, but reformed preaching is missing the elements of Matthew 10:8 – it confidently asserts that God is not doing these things anymore, effectively quenching the work of the Spirit. It is as if God was saying, to the apostles and the church in the first century he is giving signs and wonders, astonishing miracles that draw the hearts of thousands to Christ as they testify to the good news of the gospel, but to us today, he gives the bible. I love my bible. I read two of the gospels completely every week and personally, I long to see those stories in action on the streets of my city. I am sure you share the same heart-gripping desire. Charismatic preaching often (not all the time, and my assertion here is simplistic but only to make a plea)has little value for doctrine and the treasures of theology that are discovered by hard work and serious study. Somewhere in the middle, is the place where God would have us be. Committed to the Word of God, the Work of the Spirit and an ongoing endeavour to obey the leading, prompting and direction of the Spirit. Prophetic ministry does not bring new revelation that is outside of the scope of teaching of Scripture, but it does call us back to God, to His Word and to finding our purpose, comfort, hope in God. At the root of authentic prophetic ministry is the Gospel and God’s extravagant grace. It’s time to re-engage with the work of the Spirit. It’s a co-mission with Christ and He enables by His wonderful Spirit. We haven’t been told how to heal the sick, just to do it. We have a few examples of how to raise the dead, but need to know how to press past our civilised propriety. Cleansing the lepers is a challenge in the Western world because we don’t seem to have any – but we have lots of incurable sickness in the forms of cancer, diabetes and cardio-related sickness, to name but a few. Casting out demons is also difficult because we think they don’t exist today (but they are on the rampage). No pressure then! Let’s attend to the opportunities before us because Jesus wants us to, not because of the pressure to make something happen. We can’t. Some serious heart-searching will not go amiss. We are the Church-together. What we do affects other Churches, we don’t do it in isolation of each other. That is why we need to pray for the Church across the continents. God wants us to do the things He has called us to do, they are impossible but with God as the One who sends us, tasks us, commissions us – all things are indeed possible. And probable!